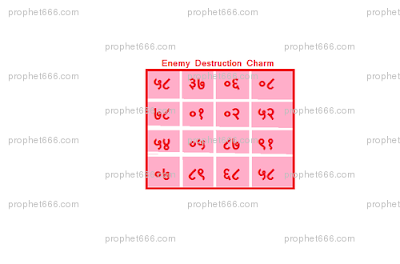 There are 2 ways of making this charm; both the ways have the same purpose; destroying the enemy. If you fail; then the tantra says you could have made a mistake in the preparation of the Yantra. This charm is different from the numerous other published before; this one is for total destruction. This Yantra is drawn on a white piece of paper with Kumkum using a pointed piece of the Hastidant [Ivory or the teeth of an Elephant]. Then the Yantra is to be buried in a Smashan Bhoomi [Graveyard]. The second procedure is to write it on a white piece of paper with Kumkum; using a pointed stick of the Root of a tree. Then the Yantra is to be buried in the home of the enemy. 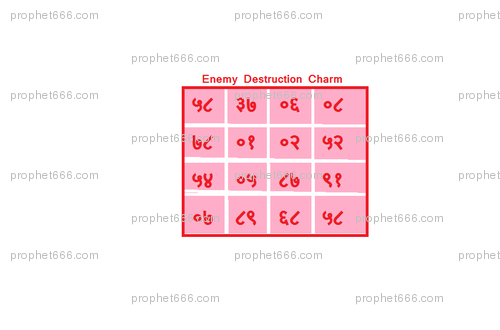 Should I not write the name of the enemy elsewhere in the yantra? How will it work if I dont specify who is my enemy? Pl guide me Guruji. Kumkum paste kumkum ko thode se paani main mix karke banaya jaata hai? If not correct kripya bataayein..
Ek prashn aur hai ki yadi shatru ussi ghar main rehta ho yo kya karain. Bury karne ki bajaaye kya kahin chupaaya bhi ja sakta hai? Neel ji Kumkum paste kumkum ko thode se paani main mix karke banaya jaata hai? If not correct kripya bataayein.. Ek prashn aur hai ki yadi shatru ussi ghar main rehta ho yo kya karain. Bury karne ki bajaaye kya kahin chupaaya bhi ja sakta hai? in the description it says Root of the tree please clarify, is any tree root would do or any particular tree root. The Root of any tree and be used for the purpose of writing the Yantra. What order do I write, ascending or descending order. Any order so that the Yantra appears as shown in the above image. guruji can the paper b folded nand kept in small place, hidden in enemy home. , I want to paste a paper over yantra so that wen a person finds it he shld not recognise it as a yantra.